For my entire adult life I have been told that the Scandinavian countries of Denmark, Norway and Sweden were three of the most expensive places in the world to live, work and travel. And that’s probably why it’s taken me so long to actually visit these three beautiful European countries. When I started planning a 2.5-month-long cycling holiday in Scandinavia, I was both excited about all that I would see and do while I was there, but I was also extremely nervous about how much the trip might cost me. Would I need to get a second job to pay for it all? Would I need to sell my house and all of my worldly possessions just to scrape by in Scandinavia? Or would the rumors I had heard about traveling in Denmark, Sweden and Norway turn out to be patently untrue? As it turns out, the truth about the cost to travel in Scandinavia was a bit of both sides. Yes, there are certain aspects of traveling in Scandinavia that are quite expensive when compared with other parts of the developed world. But on the other-hand, there were times when I was really surprised at just how inexpensive and affordable these three countries could be. As you’ll see in just a moment, Norway, Sweden and Denmark are both expensive and incredibly affordable. Like so many things in life, it just depends on how you do it. If you want to stay in fancy hotels and eat five-star meals every day, you can expect to spend a lot of money in a short amount of time. But if you want to cycle across Scandinavia on your own, camp in the woods, eat food from the local supermarkets and skimp whenever possible, then it’s possible to travel in Scandinavia for less than what you are currently living on. 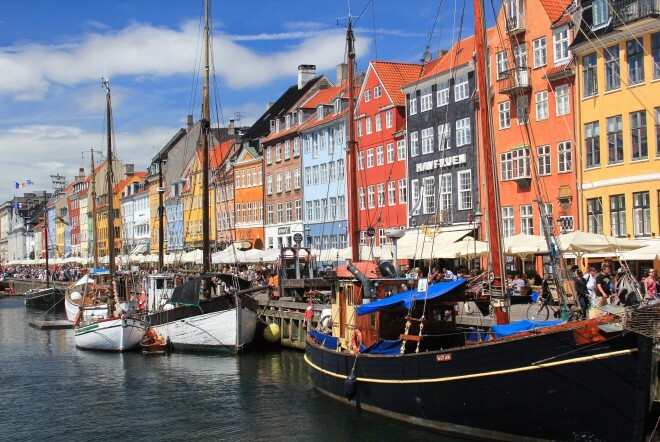 My bicycle touring adventures in Scandinavia began in the charming town of Copenhagen, Denmark. From there, I cycled north (with my friends Pablo and Ana) to Oslo, Norway – camping in my tent each night, shopping from local discount supermarkets, and picking wild blueberries and strawberries whenever possible. Once in Oslo, I met up with my friend Eric Kiraly and over the course of the next 10 days, Eric and I participated in two self-guided bicycle tours with a company called Active-Norway.com. These two bike tours were nice because they allowed us to sleep in fancy hotels each night, eat delicious meals, take daily showers, and enjoy some spectacular cycling at the same time. After my bike tours with Eric were over, I joined my friend Rob in Oslo, Norway and we cycled for about a week across Norway together to the city of Bergen on the west coast. During this leg of my Scandinavian cycling adventure, Rob and I were sleeping in our tents, shopping at local supermarkets and doing what we could to save money whenever possible. Once Rob and reached Bergen, I was joined by my friend Katelyn, who joined me on a 6-day self-guided bicycle tour in the Sognefjord region north of Bergen, Norway. Once Katelyn flew home, I was back on my own again. I spent the next three weeks living on a large island in Western Norway. I spent about $150 USD on food during those three weeks, but I had no additional expenses – as I was staying in the home of a friend (I just got lucky and they offered me their vacation home as a free place to stay). Then, I spent the next two weeks traveling across Norway and Sweden on my own, on a self-supported bicycle tour that eventually ended in the tiny town of Umea, Sweden… which is where I packed up my bicycle and flew back home. When I look back on my Scandinavian bike tour(s) now, it’s hard to express in words how great the experience truly was. I saw so much of those three countries (Denmark, Sweden and Norway)… and the truth is, it really didn’t cost me all that much. Okay. Now that you know everything I did during my 2.5 months of bike touring in Scandinavia, do you want to take a guess at how much this epic cycling holiday cost me? In the end, the grand total for 17 days of self-guided bicycle touring with two local tour companies would have been about $2,780.53. That works out to about $163.56 USD per day for 17 glorious days of high-end bicycle touring, eating delicious meals, sleeping in high-end hotels, and enjoying the company of a good friend. The total cost for me traveling on my own, cooking for myself, and sleeping in a tent for 52 additional days (self-supported bicycle touring) was a measly $1,132.40. That works out to just $19.52 USD per day. Final Thoughts – How Expensive Is Traveling In Scandinavia? Going to a new place is always a bit scary. The unknown can be frightening. But what I learned after almost three solid months of cycling and traveling in Denmark, Norway and Sweden is that these countries are not nearly as expensive as everyone makes them out to be. Yes, the prices are high for lots of things (i.e. food, lodging, entertainment, etc), but it is possible to have an incredible cycling holiday in one of the world’s most expensive places without breaking the bank. In fact, if you do it right (like the way I did), you might be able to go to Scandinavia and actually SAVE a little money! This entry was posted in Bicycle Touring Pro Articles, Denmark, Europe, Featured Articles, Featured How-To Articles, Locations, Main Articles, Norway, Sweden and tagged bicycle touring cost, cost to travel in Scandinavia, cycling costs, cycling expenses, denmark, expensive Scandinavia, how much does it cost, how much does it cost to cycle in Scandinavia, norway, scandinavia, Scandinavia travel costs, sweden. Wrong. You forgot to include plane tickets. How else do you get to Scandinavia from the US? That will easily double your self-supported cost. That’s true. I didn’t include the cost to get to Scandinavia in this article – but that amount is going to vary a lot depending on where you live in the world. For those who have to fly from North or South America, Australia, etc… yes, the cost for that plane ticket could be quite high. But for those already in Europe, it might not cost you very much at all to get to Scandinavia. I took a bus from Bosnia to Copenhagen that was less than $100 USD. And my friend Katelyn flew to Bergen, Norway for the start of our bike tour together from Amsterdam – which was also quite affordable. So yes, you’re right! The cost of getting to and going away from Scandinavia was not included here… but the cost to get there might not be as much as you think (with a little research). That’s expensive that works out as £15.17 pence a day in the UK I wouldn’t even spend a third of that so I will make sure to take plenty of food with me when I cycle through Denmark,Sweden and Finland this year.